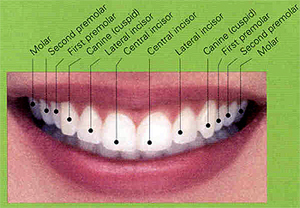 On the upper jaw, there are 2 central incisors, 2 lateral incisors, 2 canines and 4 molars making it a total of 10 teeth. Same goes for the lower jaw making it a grand total of 20 teeth altogether. The second set of human teeth is called the permanent teeth. There are a total of 32 teeth in the oral cavity/mouth. On the upper jaw, there are 2 central incisors, 2 lateral incisors, 2 canines and 4 premolars and 6 molars making it a total of 16 teeth. Same goes for the lower jaw making it a grand total of 32 teeth altogether. In the picture above, only two molars are shown. Functions of incisors : cutting and chopping food. For example : Biting an apple. Functions of canines : tearing food. For example : Tearing the chicken meat from its bone. Functions of premolars : crushing and grinding food. They are bigger, stronger and have ridges. Functions of molars : Molars work closely with your tongue to help you swallow food. How? The tongue sweeps chewed-up food to the back of your mouth, where the molars grind it until it’s mashed up and ready to be swallowed Molars are the toughest of the bunch. They are even wider and stronger than premolars, and they have more ridges. There is no exact age for loss of permanent teeth as they can shed anytime after their eruptions due to many reasons like trauma, caries,accidents. There is a temporary period where both the baby teeth and permanent teeth are present together in the mouth. This is called as mixed dentition. Baby teeth is lighter in colour compared to permanent teeth. Baby teeth is bluish white. 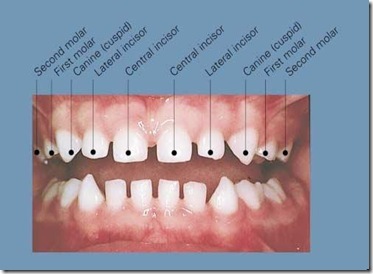 It also called as milk teeth as its refractive index is same as milk. Permanent teeth is yellowish white. 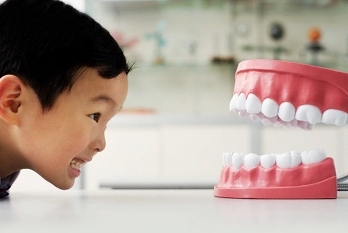 Baby teeth is much smaller than permanent teeth. If you have notice the differences between the baby teeth and permanent teeth, baby teeth does not have premolars. Baby teeth have shorter roots. Thereby, the roots are not anchored well to the bone and falls out more easily when the child falls down. The shorter roots however have an advantage. 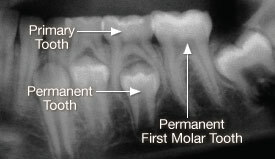 When the permanent tooth is erupting, resorption of deciduous teeth happens so that the permanent teeth can erupt easily into the mouth. A baby tooth falls out because it is being pushed out of the way by the permanent tooth that is behind it. Slowly, the permanent teeth grow in and take the place of the baby teeth. By about age 12 or 13, most kids have lost all of their baby teeth and have a full set of permanent teeth. Baby teeth has thinner enamel compared to permanent teeth, making the baby teeth more susceptible to caries, accident and sensitivity. Therefore, it is more important to start educating your child about brushing habits since young to avoid early childhood caries. Enamel is harder than dentin and pulp. 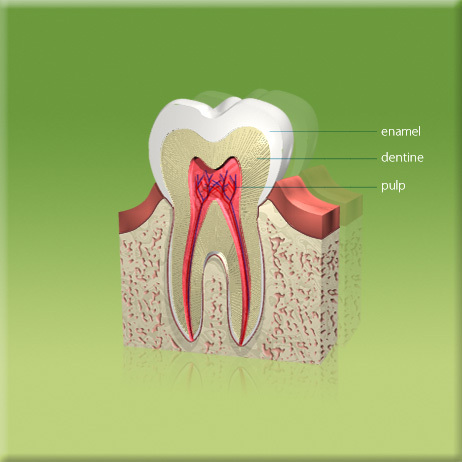 Dentin protects the innermost part of the tooth, called the pulp. The pulp is where each tooth’s nerve endings and blood supply are found. When you drink hot coffee or eat cold ice creams, fall and hurt a tooth, it’s your pulp that hurts. The nerve endings inside the pulp send messages to the brain about what’s going on (“That ice cream is too cold!”). The pulp also contains the tooth’s blood vessels, which feed the tooth and keep it alive and healthy. Permanent teeth have mamelons. 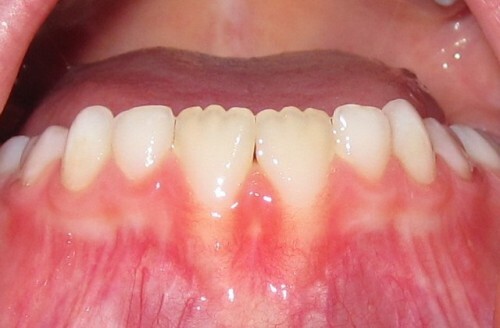 Mamelons are the small bumps that give the permanent incisors a serrated look when they first come into the mouth. Usually mamelons are only present for a short time. Since they are uneven and rather thin, they tend to wear away pretty quickly as the child uses his or her new permanent teeth to chew their food. They are the last set of teeth that erupt in your mouth.Most adults have 4 wisdom teeth. These teeth normally erupt between the ages of 17 and 25 which are considered as the “Age of Wisdom.” If these teeth are healthy and have proper alignment they could be useful; however, in many cases they are not aligned properly and hence require removal/extraction. About 35% of the population do not develop wisdom teeth at all. Wisdom teeth may cause pain if it is impacted. Do consult a dentist for an opinion and investigations(X-ray) to see whether the if the teeth is impacted and is causing pain. How Are Teeth Numbered in the Human Mouth? Hello, I am a dental hygiene student at Algonquin College. I am doing a presentation to an elementary class as part of our Community Dental Health class. I was wondering if I could use the mixed dentition radiograph that you have in the “two sets of teeth in our lifetime” article. I tried to find a “contact” for my question, but I was unable to find one. I hope this medium of communication is suitable.